I sometimes rescue paintings from secondhand shops or thrifts – originals that people have junked, not knowing what they have. Many are anonymous. I can’t figure out the signature (which is a good reason in favour of clearly printing one’s name when signing an original work of art). It’s amazing what you can find. It’s also amazing what you cannot find – like any information on the author of the work. If anyone can help me out on that front, please do so. Sometimes they come with framing and sometimes not. I found a subtle watercolour portrait marked Don Quixote, very sensitively done, about six months ago is a beat-up black frame with a hand cut mat around it. The image is done in loose watercolour washes with blues for the shadows and warm tones of peach, rose madder and yellows in the warm tones. The eyes are beautifully drawn and the mouth and nose sensitively described. “Never fear!” I thought, “I’ll just re-mat and re-frame it. Yesterday I had the opportunity to take it out of it’s frame. Oy vey! It’s backing was a dusty, dirty pulp board – the cheapest kind of cardboard with no refinement whatsoever and prone to picking up moisture. It was full of acid. The mat wasn’t acid free either. 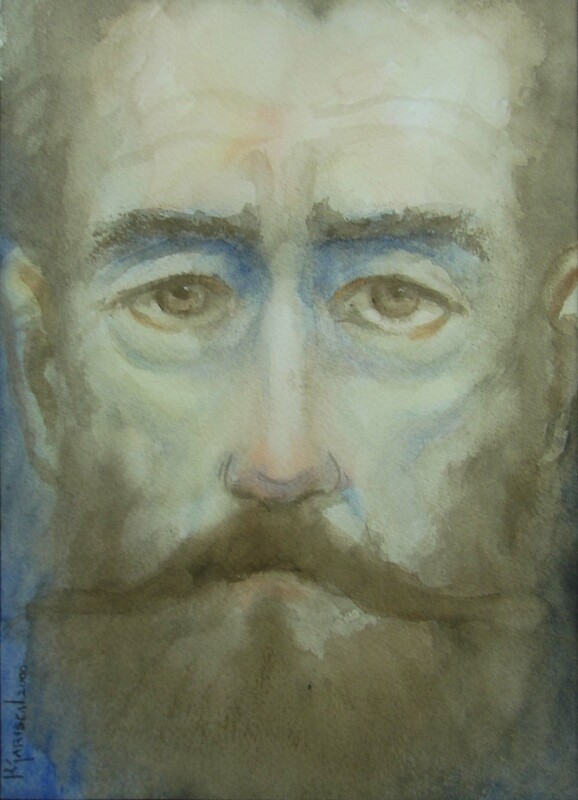 Where it had touched the painting, the watercolour paper was going brown. Yuck. It was taped in with brown paper tape – kraft tape, it’s sometimes called. The backing was nailed in with rusty nails. I don’t suppose they were rusty when they were first tapped in there. This is just a reminder – a cautionary tale. It just costs a small amount more to buy acid free matting and backing; or to use barrier paper (an acid free paper that separates the work of art from a cardboard backing). 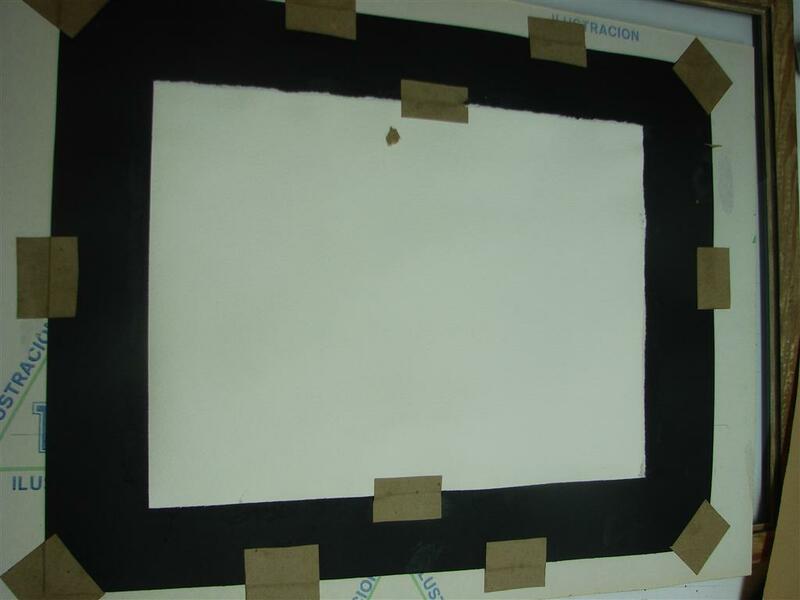 An acid free framing will last a lifetime or more without losing its crisp whiteness; the non-acid free will be brown in two years and spoil the appearance of your gem, not only dulling the framing, but eventually attacking the work of art itself. My new acquisition is now looking crisp and proud in its new frame. My favorite custom framing place is Final Touch Frames in Vancouver on the corner of 4th and Quebec in a blue warehouse space. They are reasonably priced; and if you have works on paper that need mats in the smaller sizes, there are a lot of pre-cut mats that might suit your work. Our best art comes from expressing our deepest concerns. The more heartfelt a subject is, the more intensely involved the artist is, the better the final outcome is likely to be. Thus, when a young woman’s heart bears the distressing failure to produce a child she so desperately desires and all other avenues have not helped to assuage the inability to conceive, and this same woman after years of putting away her personal pain decides to express it through her art to let it free, a most interesting body of work springs forth. This woman is Terry Nurmi, who after years of trying various methods to understand and then conquer sterility, decided to explore her voyage through visual expression. Nurmi is rooted in her community and her community became not only the physical place in which she resides, but a larger community of women who share with her the frustration of trying to conceive a child. Nurmi had spent years going in and out of clinics, being tested for this possibility and that, engaging in trials of Artificial Reproductive Technology treatment then waiting to see if they would bear fruit. Through those years, an idea germinated and grew. Nurmi would find a way to express the feelings of frustration, hope, disappointment, pain, envy, grief, and anger that a woman experiences. 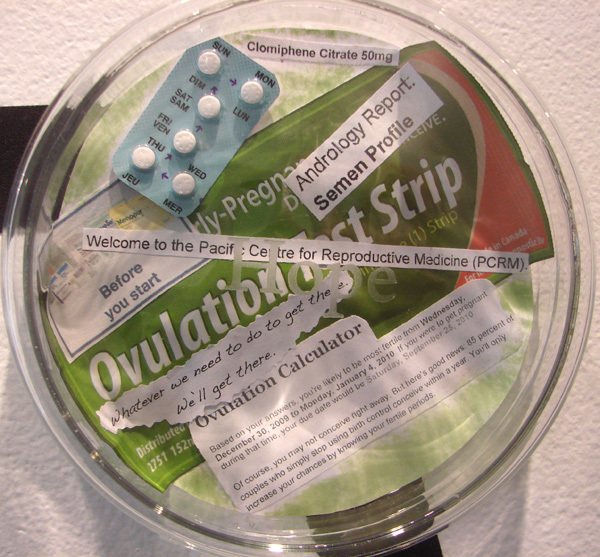 When it came to realizing this exhibition idea, Nurmi called out to her sisters-in-infertility. 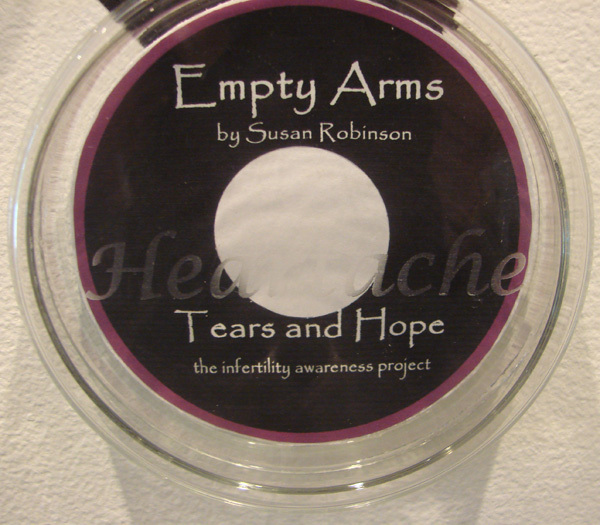 She called upon the Infertility Awareness of Canada (IAAC), Fraser Chapter, asking each women who was willing to contribute to the project to provide a collage that expressed their feelings. 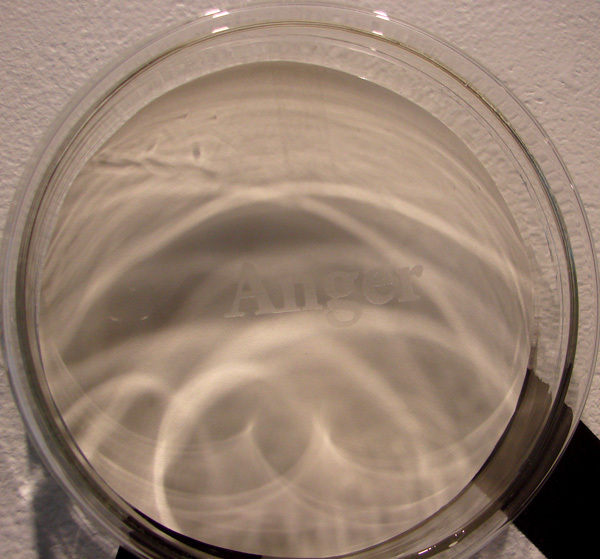 Those who responded were given a small round petri dish, a round, clear plastic laboratory dish, in which to provide a visual expression of their personal story. (Double click on each one to see it larger). 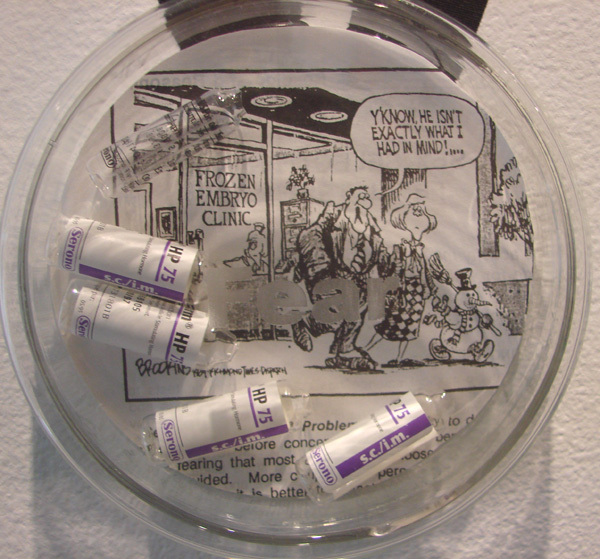 Nurmi then installed a black line on the wall to indicate a temperature chart and then placed these petri dishes at each point of the chart (see first photo, above). The chart takes up almost the full length of the gallery’s north wall. 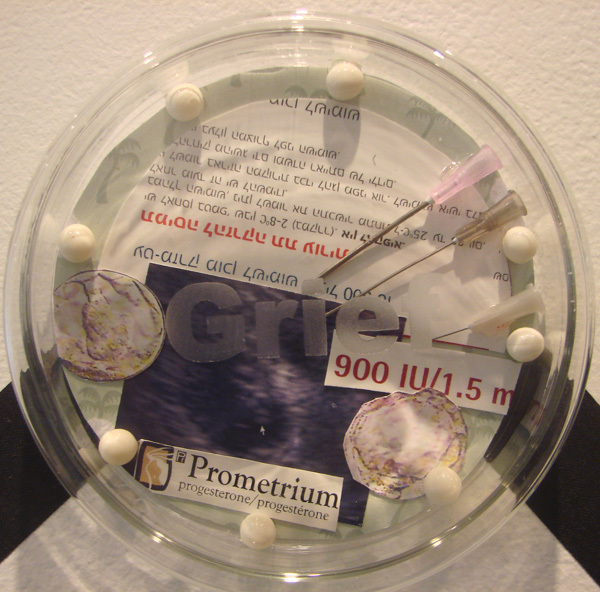 This part of the collaborative exhibition mixes installation art (the temperature chart) with conceptual art (the petri dishes); and each of the petri dishes is a miniature collage “in vitro”, meaning “under glass”. The following photos illustrate the diversity of image that resulted. Some are cold, keeping the viewer at a distance; others indicate frustration; still others manage a bit of black humour (the one with Frosty the Snowman). Some are empty (Anger) awaiting the babies that do not come. It was a delight at the exhibition to see people pouring over each one of these little, clear disk boxes. Raw sentiment is contained within. Across on the South wall of the gallery, are several cross-over drawings-become-watercolour (and some pastel). 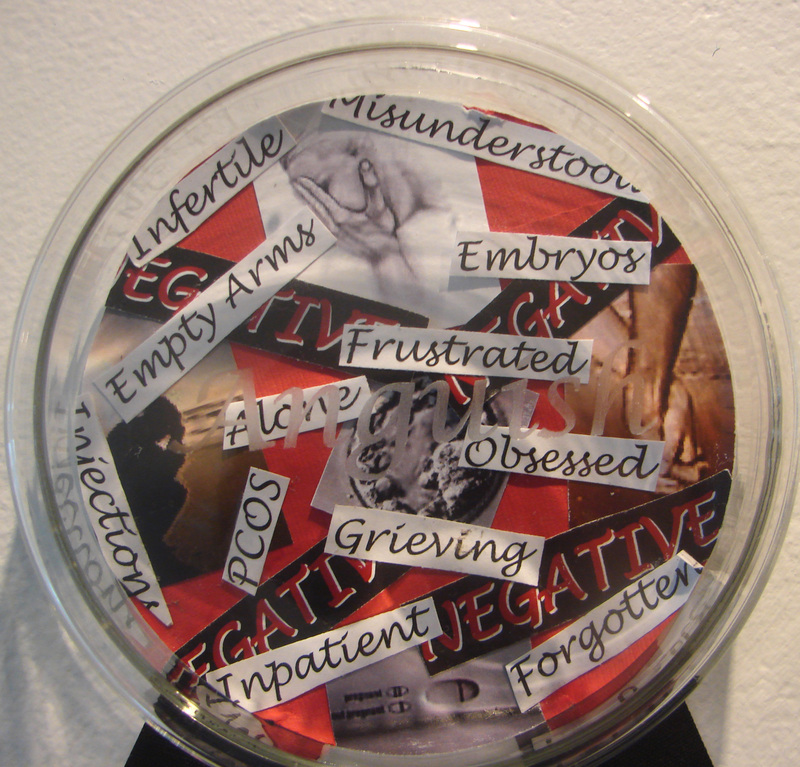 Each represents a baby in Nurmi’s life – babies belonging to sisters and sisters-in-law; friends or extended family. They express that fragile and innocent time a child’s life. The infants are sleeping or just waking. Knowing Nurmi, there is bittersweet heartache in these images that does not go away. Yet these images capture the innocence and beauty of infancy. From a technical point of view, these drawings are fresh and lively. Each is drawn with strong and sensitive line, then enhanced by chalk pastel and watercolour. She is mistress of her medium. The work exhibits a lot of freedom and yet there is nothing gratuitous. Every mark made is necessary to the drawing and the maturity of the hand is delightful to see. 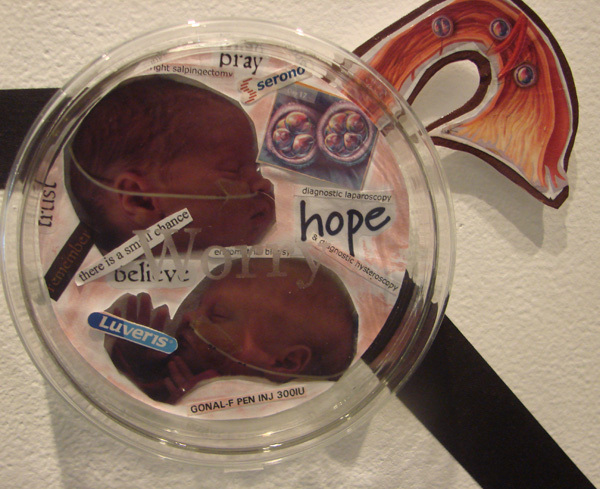 Once again in reference to “in vitro” , each of these mixed media, mostly watercolour paintings is framed between Plexiglas and clips to reinforce the concept of “under glass”. There is quite a bit more information on the web about this recent exhibition, so if you are interested, I’d suggest a Google search. The exhibition is on until June 6th at the Fort Gallery in Fort Langley. I had been in for a bit of business and took the time to see the show that was on. There were a few of Tong’s paintings up with other gallery artists’ work at the back of the gallery and they held me transfixed with the detail and the ability of Andrew Tong to reach, retain and define that space between reality and subconscious. Now you will be able to see a full solo show of his works. It’s a great opportunity. Andrew Tong, you may remember, was one of the artists in the Drawing Show in August, who exhibited small but very precise illustrations of nursery tales with a morbid or violent twist – nothing so overt as a graphically described horror, but there always seemed to be a menace of some ill-fortune underneath and waiting to happen. It is rare that an artist of minute illustrations manages to also paint large scale canvases but it was exactly this that held me riveted to the works I saw. There is so much going on in them and the workmanship is so fine and detailed that there is lots to absorb one’s attention for a first look and then plenty of things to discover or rediscover when you come back to look again. In Enemy of the State, a child holds a toy pistol to his hostage teddy bear. There are ambiguities to ponder. Is it a girl or a boy? Who is the child looking at? The child has a pin stating “I am 3” but the eyes of the child are old with sadness, disabused of his childhood through war perhaps or maybe a surfeit of television, news or family violence. He is interrupted in his activity, suspended from the fatal shot of his blindfolded hostage. 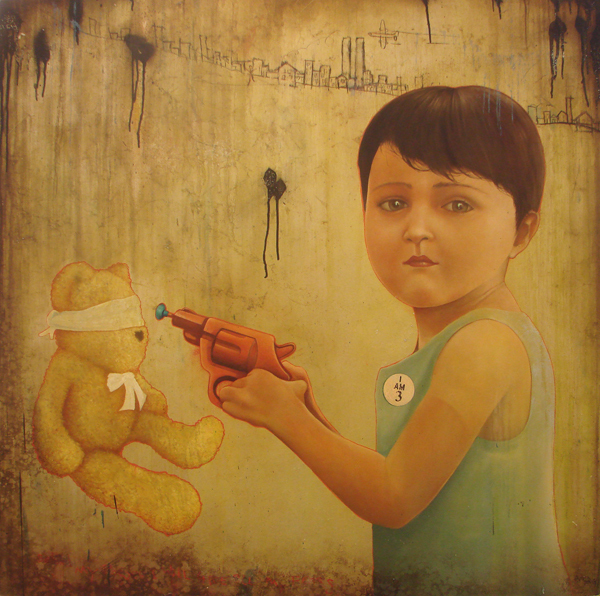 So the question must be asked, is it the toy bear that is the enemy or the child who perpetrates the age-old practice of man which is war?And in the detail of the khaki-coloured background symbolic of military, there is a small drawing of a city scape. Are those the twin towers standing proudly, an air plane barreling towards them, unconscious of their upcoming destruction? 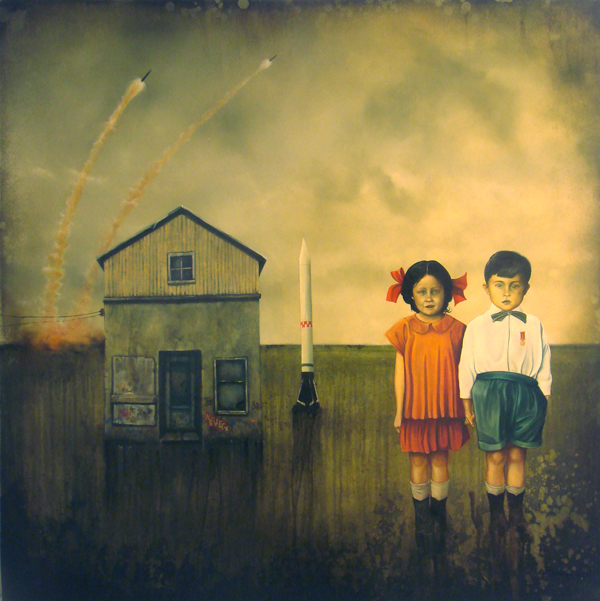 In Dreaming of a Blue Sky (above) two children stand to military attention before an old house. In the grey sky, bombers fly; a warhead stands like a pillar, equally at attention. Bombs are exploding at the horizon. Is it smoke from explosions or just bad weather that colours the sky? The sad looking children all dressed in Sunday best are waiting for the skies to clear, perhaps dreaming of a day when the airborne violence will no longer be a part of their daily lives. His imagery is at once overt and challenging and yet understated so that you miss something if you don’t take the time to seek it out. 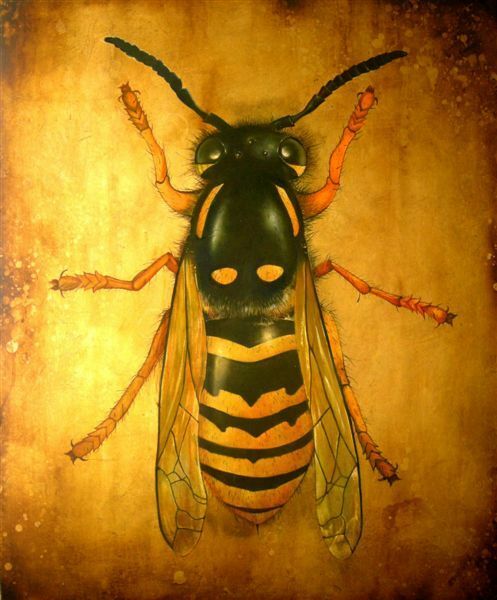 On a more illustrative bent, Vespula vulgaris serves to show Tong’s awesome draftsman-like abilities in realism; and similarly, Origins of Violence, although the first of these is only 20 x 24 and the second is 36 x 36 inches, the difference in scale being critical as a measure of difficulty, and a tribute to Tong’s versatility in being master of both. Tong chooses smooth surfaces (oil on panel, plate or hot-pressed papers) to achieve the detail. His small drawings can be magnified and still appear perfectly executed; his oils are built up with detail through glazing. There is great mix of realism and abstract. There is a stillness, trapping an image in time, and yet activity like bombs descending or planes flying past. There is smoothness and yet texture (like the distressed wall in Origins of Violence). And yet all of these contrasts seem effortless. It’s the same effortlessness of a Gold medal skater flying perfectly through a quad jump – you might not even notice the degree of excellence achieved in a split second but through years of practice, if someone didn’t point it out. Take time to delve into the metaphors. allusions connections he makes; enjoy the craftsmanship and detail. And if you are in the Vancouver area, make sure you see the show. Photographs are wonderful if you can’t get there, but seeing the real thing in the proper scale is a hundred times better and this will be an exhibition not-to-be-missed. I had understood that there would be a larger show, and in fact it is the smaller illustrations that are being shown at this time. I thought about revising the text, above, to reflect that and have decided to leave it alone. It flows. The main thing I wanted to do with this post is to bring Andrew Tong to your attention; and I think I’ve accomplished that. I like his work and think it is not only visually interesting in subject matter and iconography and there is also a great degree of finesse in the craftsmanship. We’ll just have to wait for a show of the larger works. Hopefully there will be one! I’m not much at tooting my own horn, but I’m going to do it today. On August 20th, the opening for the Painting on the Edge exhibition was held at the Federation of Canadian Artists Gallery on Granville Island in Vancouver. I asked them if they knew Piet Mondrian and both did. They both liked his work, they thought, but neither had really understood what he was doing nor the principles that would make a line and a square placed strategically on a picture plane – to be considered worthwhile or valid as artistic imagery. There were several pieces that appealed to my aesthetic, but I also found that the quality of pieces shown was quite inconsistent and if I had been choosing, there would be six of the fifty that I wouldn’t have shown at all. If I can I get copyright permission, I will post some of them for your viewing pleasure. In the mean time, if you want to see the fifty images in the Painting on the Edge show, go to the Federation of Canadian Artists web site and click on Current Exhibition for details. It’s worth a visit with lots of time to ponder. This is adventurous, thoughtful work showing. Different materials, different formats, inspired ideas, excellent craftsmanship. Earlier in the day, I went to the Elliott Louis Gallery on 1st Avenue just east of Main Street by one block. 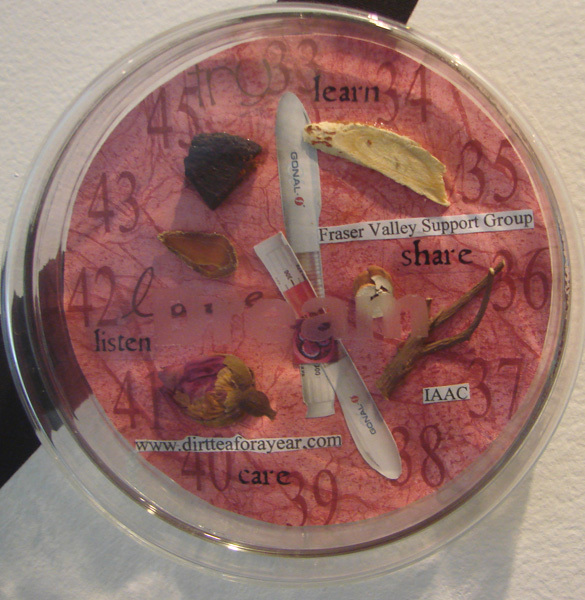 The 5th Annual Emerging Art show is just up and the opening was this evening. I couldn’t be in two places, so I took a quick look in the afternoon before the crowds came. 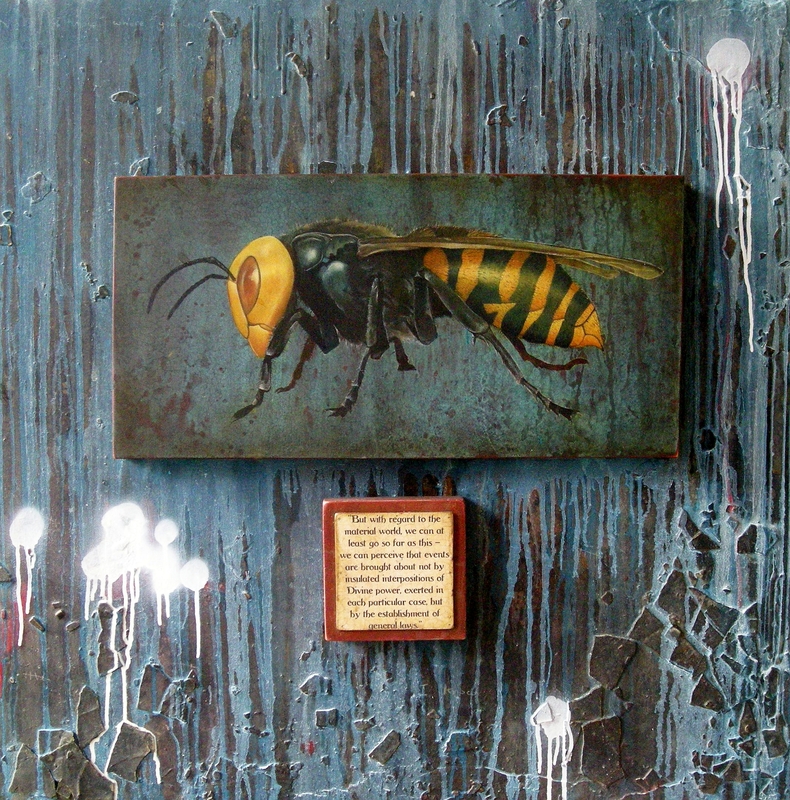 Wendi Copeland is showing in both exhibits. At the Elliott Louis Gallery, there is a suite of paintings with her starting point being the palette of one of Jack Bush’s paintings. First in her series is a very formal accounting of the colour palette. In subsequent paintings, she interprets the colours in different ways as if, for instance, looking at a rippled water reflection, or as if looking through a piece of wavy glass. Something struck me about the Emerging Art show. In the advertising, the images are small thumbnails and some are and some are not interesting. For example, the images of Brian Kokoska have some of the same disturbing human relationships as the iconic Oscar Kokoshka of the early 20th Century. Seeing the paintings in real time, though, the impact is quite different from the thumbnail teaser which looked adolescent in small size. The originals are more powerful and rich. The size gives an immense visceral feel which is why one needs to actually see the art work. You can’t trust the thumbnails for any of the artists. Whether or not I liked Kokoska’s work is immaterial. The important thing is that he is conveying a message and it comes across just as he intended. It’s in your face; and the handling of his imagery to do so is very well executed. The colours are vibrant and clean which is difficult with the colours he is working in. His drawing in paint is direct, freely handled. That brings me to an aside that is worth thinking about here. Artists paint for different reasons. Some pitch to the home buyer, painting to the home decor market of landscapes, flowers, portraits and people. Some pitch to the commercial need of wall decor, such as restaurants and hotels. The work has to meet a decorator’s needs of harmony for the entire project. There will be abstracts or large landscapes, paintings of fruit or food. But some don’t care whether you understand or not; they are painting with a message whether political, social or personal; or their works are esoteric, delving into the abstractions of art itself. Their works are not necessarily meant to sit over another person’s living room couch. The clientele for this kind of imagery might be a museum, an art gallery or a fine art collector. I see Kokoska’s paintings fitting into this latter category. I would say that for all of the artists in this show, my reaction viz the thumbnails was the same. The small version of the work looked ordinary; the real work was far more exciting, far more engaging. The corollary of this discovery is that, to see an exhibition, you must go there and engage directly. Katherine Coe’ s images of heads with animal headdresses are exquisitely drawn combining traditional technique with surrealist imagery. Gail Alexander’s series Living on Airlie Street collages photographic imagery in an abstract fashion to create nostalgic and poetic works about family history. Adam Dodd’s images are non-representational, reminiscent of mid-20th Century abstraction. There is still much to be said and explored visually in this domain. I was quite engaged both by his use of colour and the fluidity of his forms. Kate Fisher and Michelle Jean Giguere also did not present well in the small thumbnails but in the real work it’s quite the opposite. Fisher is working in portraiture, with the three shown here all larger than life heads only. The paint handling and colour work are what make these works exceptional. Giguere’s landscapes are surreal, with a far higher degree of realism to convey the imagery. Gavin Lynch, on the other hand, purposely obscures the landforms as if seen by a camera at high speed or through spectacles made for someone else’s prescription. The thumbnails conveyed nothing of this. And it makes for some interesting viewing. His painting technique conveys these sensations of distortion quite adroitly. Sean Wiesberger, Amanda McMorran, Helma Sawatzky, Scott Billings, McMorran, and Caitlin Brittania Terry are also featured in this exhibition. There is no image to accompany this post. You will see why. A couple of days ago, I posted my latest watercolour called “McDining” and if you look back a couple of posts, you will see a modified image of “McDining”, the object of a legal question. I was uncertain as to my right to publish the painting since I had taken a photo of a man eating at McDonald’s without his permission. He had no idea that I was photographing him. I have since altered the photo in Adobe Photoshop so that the face is missing. Anon is eating at McDonalds! Over a late evening cup of tea at Mrs. Stepford’s place last night, I had a chat with her husband a well respected lawyer in town who is quite aware of legislation and precedence on this subject. Military and police have the right to capture a person’s image without their permission. It’s in the best interests of law enforcement and the public good. But an individual is not allowed to take a picture of another individual without their permission and they may not publish it without the subject’s express permission. “Well,” proposes Mrs. Stepford in support of my cause, “what if she took the picture before she asked permission and then asked him if she could take his picture afterwards, and he agrees. Couldn’t she use the picture? Mr. Stepford is completely disgusted with our moral turpitude. No means no! If a model is hired to be painted by an artist and takes money for it, it is assumed that he or she is giving permission in the process. If you ask someone before you take the picture if they mind if you do so and they are willing, then you can take their photo, but if you want to paint them using the photo for reference, then you must also get their permission to use their image in the art work. This applies to photographers, including the press who must ask permission before publishing a person’s picture that hits the six o’clock news. So I guess my McDining is confined forever to my own private viewing. I could take a risk and show it, says my lawyer friend – a risk that might end up with a $20,000.00 fine if the owner of the profile decides to sue for the breach of his privacy. Well, maybe a few friends will see my painting, McDining. And maybe, like Roger Bacon, I could distort the faces; or like those pop-up books we had as children, put someone elses face on the image, someone I know, who gives me permission for the use of their facial image. Or maybe take some self-images to put in place of the colonel’s head. It might be quite surreal. I haven’t given up on my McDining image. It’s just got me thinking. I shall try it again in another configuration. It comes in an infinite number of forms, and just when you think there is nothing left to think up, someone creates the unthinkable, in a good sense – something simply not thought of before. Think of Giotto who revolutionized the Renaissance way of painting; and van Gogh whose painting was so different from others that he created a scandal with it and nobody was remotely interested in buying it. Because of his work, art norms have changed. It’s quite acceptable now. Think of the Impressionists who rejected the Academic way of painting; and the Art Deco movement that rejected the Art Nouveau style. Or the Abstract Impressionists who were outrageous for their times. Jackson Pollock stirred up quite a furor with his expression through throwing paint at a canvas. With a quantum leap in style, the Op Artists reverted to a precise expression of optical illusions. And then we have Basquiat. If someone had not gotten him to paint on canvas, he still would only be an unknown graffiti artist. 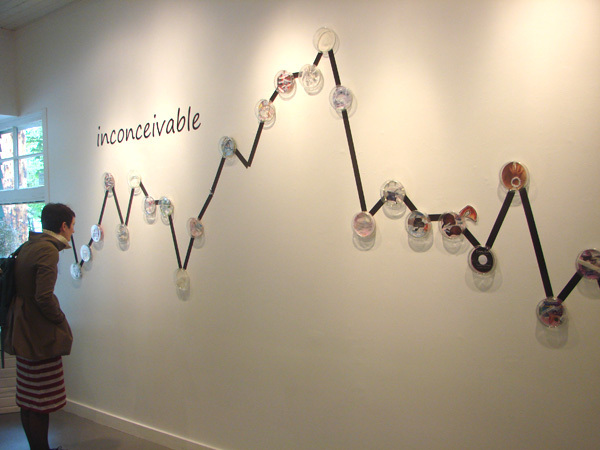 And, are you getting comfortable with Installation Art yet? “Is it art?” we ask ourselves. Barnett Newman’s Voice of Fire (1967) outraged the Canadian public when the National Gallery purchased it for $1.8 million.It sparked a public debate, a horrified outcry that still simmers in the hearts of the disbelievers. Art is not born of nothing. It grows and builds on what has come before. It modifies. The building blocks are the same – colour, form, shape, mark, tone – but how we put these together is what creativity is all about. Given a big box of colourful Lego to make something with it, each artist creates a different object according to their disposition. Given the infinite variety of art materials available, there is an exponential variety of expressions that result. Myself? I have a predeliction for working in representational modes, and given that precision is not in my nature, I have learned to accept that it perfectly all right to do so even though, from time to time, I wish I had that uber-vision that some other people have in perceiving and representing infinite detail. Other times I am in awe of someone’s ability to be tremendously organized and precise in their expression that nonetheless produces a work of intricate beauty. These are interesting geometric works of great precision and his colouration plays with various harmonious ranges of colour spectrum. They are made with acrylic resin on canvas and for me, the medium seems to enhance the impression that I’m looking at stain glass works, not paintings. Last night Bristol Life Drawing left me a reply to a comment I made some time ago, which restarted a discussion that continued on. I really recommend the Bristol Life Drawing blog, especially as I really like figure drawing. I like the bloggist’s commentary. So have a look if you like. Specifically, this post was the trigger for discussion and I’m repeating my reply here, because I find the subject interesting, and you might too – and you might otherwise not find it if your are unfamiliar with Bristol Drawing. If you want to get the discussion from the very beginning, look up this post and the ensuing comments. Modernist still-life? I’ve rescued a few of them from the Salvation Army and other thrift stores lately, along with some other out of fashion originals. I visit an elderly gentleman, friend of my mothers, in his late nineties who collected art in the period of 1930 to 1970 and collected some good brand names, so as to speak, of the modernist genre – nationally, if not internationally, icons that are largely unrecognized now by other than a few cognoscenti, those in the know. Some of these paintings really no longer appeal to the current taste. They look childlike and brutally inept. Those modernists, though, opened the door for following generations to allow exploration and creativity, to encourage insolite and eccentric vision. It was a good thing. It engendered a whole lot of positive creativity. Do you remember all those “chocolate box” and “Pompier” works of art that we were taught to abhor in Art School? For those who may be following along who are not familiar with these Schools of Art, they were most popular in the 19th Century. The first, in general, had sweet subjects of little girls in pinafores, garden scenes with cottages, mothers with their babies or little children, little boys catching toads or newts. You get the picture – sweet, redolent of happy homes, wild English gardens, play at the seashore – nothing controversial and nothing deeply philosophical nor symbolic. The second, from the same period of art fashion, was a hugely bombastic, emotively dramatic, often glorifying soldiers and war, and was steeped in allegorical imagery. It was favoured by the French Academy of Art. It was sneeringly called “L’art Pompier” or translated, “Fireman’s Art”. Wikipedia has a good explanation of L’Art pompier, if you want to know more. I was interested to see, relatively recently, that some renewed interest in these Schools of Art had once again become a lucrative trade on the auction market. I mention these two schools of art because, without a strong grounding in anatomy, neither one of them would have been remotely interesting. As a curious aside, I wonder how a comic book artist or caricaturist would handle a take-off on Bougereau’s “The remorse of Orestes” (which is the illustration for the Wikipedia reference I made up above). I can’t imagine it working at all! And yet, just look at that painting! If I had one tenth of the ability to draw those luscious nudes with so much movement, tension and emotion, I could die and go to heaven. After all these years of painting and drawing, I still only get the best that I can do, but it’s rarely what I see or what I want to do. So why did I mention all this? What’s fashionable in art comes and goes. There’s always an “Academy” of thought that imposes its self-made criteria on the peons without influence telling them how they should think, do and produce. Art is influenced by our times and progress, whether that’s the right word for it or not, is characterized by rebellion against what has become normalized through time. Even the Impressionists have fallen into a slump, if you are an upcoming student of the arts. Yes, they may be making millions at auction, but if you produce them in your art school these days, you are mocked to Perdition. Installation art is in. I mention it because I remember going through some European countries – mostly France, Germany and England – in my first sabbatical year, going through museum after museum and steeping myself in Northern European Art History. I was awed, quite simply. I based myself in Rheims where I attended Art School. It was still operating on the classical method of teaching drawing and painting, with Classical plaster statuary, figure drawing and perspective classes that have since been tossed out the window in Art Education, even in Rheims. I struggled to get a good figure drawing. Despite my degree that allowed me to teach children what art was, I couldn’t draw. It was a year before I could do a decent figure and then, only sporadically. When I saw Dominque Ingres’ beautiful nudes, they were to die for! – his ability to draw a hand as if it were alive! his beautiful transitions, his ability to express the roundness of his models, the softness of the skin, the absolute draughtsman-like ability to get proportion right. Well, that’s why we consider him a master of his art, n’est pas? Quite rightly, for me, I fell in love with figure drawings (and paintings) and have wanted to succeed with them ever since; and because I never have, to the best of intentions, I have to keep on going back to it to get the next one right. As a result, I’ve got a basement full of three-quarters-good pastel drawings that will never be seen! I am spared the thought that my mother (unlike Whistler’s) will burn them all when I die, because she has predeceased me; but I shall nevertheless regret some fool executor trashing the bunch of them because they are out of fashion or because they are deemed by that person to be untoward, unChristian or somehow lewd. I’m out of step with my times. I should be out there creating spare pile-of-rock installations in warehouse sized rooms; or decorating the landscape with a trail of a thousand white umbrellas. One thing I am mightily thankful though, is that in my era, creativity has become accessible to the masses; and the revolt against the Academic strictures (both then and now) of What is Art have been successful in giving each of us permission to take the avenue that we desire to pursue in expressing ourselves, whether it be through traditional landscape, still life or portrait, or through more experimental modes of expressionism, impressionism, conceptualism, minimalism or any of the other ism you can think of. The door is wide open. Hooray! And if the figure is a hard-sell these days, I perceive that all art is a hard-sell. The dollars or Euros or pounds are not the purpose of it. Creativity is. So sell or no sell, I’m very happy to be painting and creating as best I can, because it enriches me and sometimes enriches others when they see it, and because it’s such a positive and satisfying activity to be involved in. It’s the last Saturday before Christmas and I went grocery shopping this morning with Mrs. Stepford. There is a big storm forecast for Sunday with little chance of a good road clean-up before Christmas, so we were both picking up things we would need for the festivities – that is, if any one can get here for them. Between us, we filled up a grocery buggy full of food and we were both grateful to be able to do so. Our next stop on this very busys day was at an artist-friend’s house. She was collecting gifts and household items for a women she is sponsoring who has fled family violence with her two teenage sons and is living in a battered women’s shelter. The contrast of our ability to go out and buy what we needed/wanted for the holidays with her inability to go out into the community for fear, coupled with her current destitution was powerful We were very thankful for our respective prosperity. We stood in line for fifteen minutes, the lines were so long. The combination of storm warning and the seasonal festivities had increased the number of shoppers exponentially. Once our two missions were accomplished, we needed to grab a quick bite somewhere. We opted for a gas-station lunch counter reminiscent of the five and dime counters of the ‘Sixties. The fare was plain but adequate. We avoided our favourite department store lunch counter because the mall parking was crazy and there was a likelihood with all the shopping that the service would be slow. We had a destination to make by two. The event was a talk by Doris Paterson about her life and her work at the Maple Ridge Art Gallery. I’d seen the work a few days previous and found them most interesting. Where the average time for viewing a work in an art museum has been calculated at three seconds, I found myself taking five minutes in front of one and then the next of these very vibrant images. I convinced Mrs. Stepford that we had to go and go we did. Doris Paterson is eighty-four and full of energy. Though she spoke of slowing down a bit, as she continued on, it was obvious that she would be creating images as long as she lived and breathed. The show had forty-nine images, mostly paintings in acrylic on three hundred pound paper, but some collage work and hand-pulled prints done in the Japanese method as well. The works spanned several decades so the styles changed as Paterson, a continuous learner and explorer, continued to add to her repertoire of skills and perceptions. I fell in love with several of them, and given the lottery, I would have purchased several to live with and look at day to day. The one I show at the top of this post, she explained, was of a friend whose husband had died and she was having to sell her home and leave all she had built into it. The stately woman stands by the door, looking out at a wild grassland view that has fed her soul over the years. Her pose captures the wistfulness; the woman’s heartache; her quiet thoughtfulness. It’s a universal message of loss and continuity. Other paintings of this earliest period illustrate the daily life of the community, like the woman in the bakery. In this period,her drawing is figurative and elegantly so. She captures the specificity of faces; the detail of hands; the complicated composition of the bakery counter and its goods. In a series aabout women artists that follows, she begins to incorporate collage into the imagery – bits of wallpaper and cloth, paper patterns and such-like. Her composition and her use of shapes to define large areas of light, medium and dark tonality help give impact to her work. Unfortunately the gallery lights prevented me from getting any good photos of these to share with you here. This one has an unfortunate bit of glass reflection on it. There is a greater degree of abstraction coming into the work that begins to take over. The next series resulted from a workshop that affected her work profoundly. She would begin to paint, she says, with nothing on her mind. After she had applied a few layers of paint, which resulted in a build up of rich colour and texture, images would begin to appear to her. She would reinforce these images, sometimes outlining them or cutting the shape of them in a collaged material. There is still figuration, but the abstraction of shapes and ideas intensifies. More is left to the viewer to determine. Her move from realism to abstraction offended some of her best patrons, but she forged ahead regardless exploring methods and materials within the context of her creative imagery. Soon she was leaving representational images out of her work entirely. Some show the influence of Friendsreich Hundertvasser and Paul Klee; two were clearly in homage to Matisse in his cut-out shape period. Her own voice prevails though. Her composition is engaging. It succeeds in keeping they eye moving back and forth through the shapes. There are stopping places and lots of coming and going, but the over image is balanced without being static. Her earlier favouring of shape continues strongly in these works. What you will not see in the photos posted here, but you see clearly in the originals, is the glow that is created by the multi-level build up of underpainting. There is a richness of both colour and texture. These are beautiful abstractions to live with. Latterly, Paterson has been exploring again, using a build-up of curved lines to create a pattern. Once the exuberant grid is established, she works with colour in the interstices to establish movement in the overall image. These works are quite joyful; and I must apologize for the quality of the photos, again. The interior lighting gave a yellow cast to paintings that clearly had bright white grounds. Even with colour adjustments, I couldn’t adjust the images to their original pure colours of French Ultramarine and Cerulean Blues. and I’m not sure if I have the colours quite right on the following two either, but they are representative, in any case. This woman has born and raised ten children; she’s written two books and is working on a third. She’s a steady fire of creativity and, as you can see, I was very happy to have not only caught her exhibition but also to have heard her talk about her art journey. After a social cup of tea with the artist and her audience, it was a let down to go finish our mundane chores of providing for the festivities. Once again I’m writing at an ungodly early hour of the day. It’s time to go and pull the banana loaf out of the oven and get myself some sleep. So I bid you a wonderful day, a Seasonal wish of joy and familial harmony. Good night. Have a look at this site, with more of her recent abstract work.